"My son took AP Calculus BC last May as a sophomore, and received a 5, with an AB sub-score of 5 also. "Our oldest graduated last May from homeschool. He used your Geometry, Algebra II, Precalc, and Calculus (1st half of the book). He has done very well with math. Last spring he took the AP Calculus AB exam and earned a 5 on it, the highest score. He just completed his first semester in engineering at Virginia Tech and received A's in both of his math courses, Calculus II and Vector Geometry. Chalkdust works! Thank you for your thorough, challenging program. The text for this course is Calculus of a Single Variable, Ninth Edition, by Larson and Edwards. 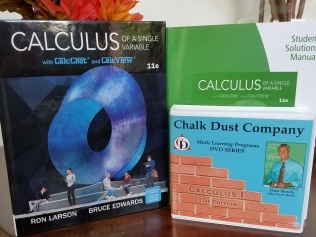 The text actually covers two courses - Calculus 1 and Calculus 2 - but the DVDs and the complete solutions guide cover only Calculus 1 which includes chapters on preparation for calculus; limits and their properties; differentiation; applications of differentiation; logarithmic, exponential, and other transcendential functions; and differential equations. The textbook includes hundreds of application problems in biology, business, chemistry and physics. This is a true college level course. I suspect that most students tackling such a course will want to earn college credit if possible, so students should check with the college of their choice beforehand to make sure they will have the opportunity to test out of Calculus I once the course is completed. I would not be surprised if the college uses the same text since it is one of the most popular calculus texts. Sir, I have received your technical support, I have bought a new Pioneer DVD player and I have experienced not a single problem. Moreover the lessons are magnificent and I'd like to thank you for your professionalism in handling things.